With spring right around the corner, both you and your dog might be looking forward to the great outdoors. But before you head for the brilliant sunshine and lush grass, take the necessary steps to prevent fleas and ticks from latching on. These simple steps are easy, effective ways to protect your pet and home from fleas come springtime. It turns out that maintaining your lawn is great for both your home’s curb appeal and your pet’s health. This means something as simple as keeping your lawn mowed and shrubs trimmed. The closer that shrubs and trees are to your home and windows, the greater chance fleas have of moving indoors. Less shrubbery on your lawn means fewer hiding spots for pests. Another important thing to keep in mind is the appearance of raccoons, stray cats, and other feral animals. If you have the habit of placing bowls of food outdoors for these animals, you might want to reconsider it. They are almost always infested with unwanted fleas. Oral flea medication, arguably the most effective and convenient way to eradicate fleas, comes in the form of chewables or pills. Whenever a flea bites your pet, the active ingredients in the medicine are transmitted to the flea to kill it. The unique chemical ingredient in each type of oral flea medication targets fleas in different ways. Some target adult fleas, while others target larvae. Some act to prevent fleas from laying eggs. The type of medication that’s best for your dog depends on the stage of infestation and his or her own health. That’s why it’s important to work with your veterinarian to identify the best plan of action. He or she will also be able to warn you of side effects that may be seen, especially if your pet uses other medications. Even if fleas have been eradicated, it’s likely that eggs and larvae have accumulated unnoticed in your yard or home. That means that they can infect your dog a second time if left untreated. In the home, eggs and larvae are often found in carpeting and rugs. So, be sure to vacuum these areas several times a week, especially if you’ve experienced a recent flea infestation. Also remember to vacuum under furniture, cushions, or anywhere in the home that your pet frequents. According to the Agrilife Extension Service of Texas A&M University, taking these steps can eliminate 30% of larvae and 60% of flea eggs. After vacuuming, make sure to empty the vacuum bag and change it frequently. Due to their convenience, many pet owners reach for spot-on treatments that are simple dabbed onto the skin of your pet. However, different products are designed for different types of dogs and will vary in potency. Therefore, you must follow the provided instructions on the label carefully. It is generally recommended that you consult your vet prior to use to identify the best course of action. Immediately after returning home from time outdoors, take a few minutes to visually inspect your pup for fleas or ticks. Check in between the toes, in the ears, and around the neck area. If you have a long-haired dog, be sure to spend some extra time looking through fur as well. This simple step can help you prevent an infestation before it ever begins.As for most other things, prevention is the best policy. We encourage you to be proactive in protecting the health of your dog. Simple preventative measures can save your pet from itchy bites and potential infections, while also saving you from expensive medical bills down the road. If you want to get started on protecting your dog from fleas, we recommend scheduling an appointment with a veterinary professional as soon as possible. A reliable and experienced team, like that of Cherrelyn Animal Hospital, can recommend the best methods and products for you and your furry friend. This month you may have given smooches to your Valentine, but how about your pet? Whether you receive many kisses from your dog or cat (or a rare few) have you noticed anything about their breath or teeth? You may want to pay attention to how often you go on dental checkups for your pet. Many pet owners may not take special note of their pet’s dental hygiene, but dental health is one of the most commonly neglected areas in pet health. Four out of five dogs over the age of 3 years old have a kind of dental disease called periodontal disease. In fact, by the time your pet is 3, it is very likely that he or she has at least some early evidence of its onset. If preventative measures aren’t put in place, the disease will worsen. Periodontal disease starts with something that is familiar to most of us: plaque. At first, plaque is soft and can be removed by simple brushing or, in pets, chewing hard foods and toys. However, plaque that is not removed will harden into tartar. When this happens above the gumline, removal is still relatively simple. The problem for your pet will occur when plaque and tartar build up below the gumline, setting the stage for infection and damage to the jawbone and other surrounding tissue. At its most viscous, periodontal disease destroys the tissue surrounding the tooth and the bony socket that holds the tooth in place. Ultimately, the tooth will become loose. Advanced periodontal disease can also cause health problems in your pet’s kidney, liver, and heart muscles. Fortunately, these problem can be avoided by simple dental checkups and cleanings. A regularly scheduled dental checkup is the most effective way of monitoring your pet’s dental health and preventing more serious complications down the line. It is recommended that all pets undergo dental examination and cleaning once a year. A routine dental checkup consists of an oral exam of your pet’s mouth by a veterinarian. Because most dental disease begins and festers below the gumline where it cannot be seen, a thorough dental cleaning and evaluation are performed under anesthesia. X-rays can also be used to examine the health of the jaw and tooth roots. Why Does My Pet Have to Undergo Anesthesia? At our own dentists, we have to sit still and hold our mouths open in order for the dentist to work on us. However, our pets are less able to understand the concept and may react by moving, trying to escape, or even biting. Anesthesia on your pet will make the dental examination and cleaning much safer and less stressful for you, your pet, and the veterinary team. The American Veterinary Dental College does not recommend dental cleanings without anesthesia. These types of procedures do not allow for cleaning or inspection below the gumline. Furthermore, “anesthesia-free” dental cleanings require pets to be restrained, which can be uncomfortable and frightening for your pet. How Can I Take Care of My Pet’s Teeth At Home? 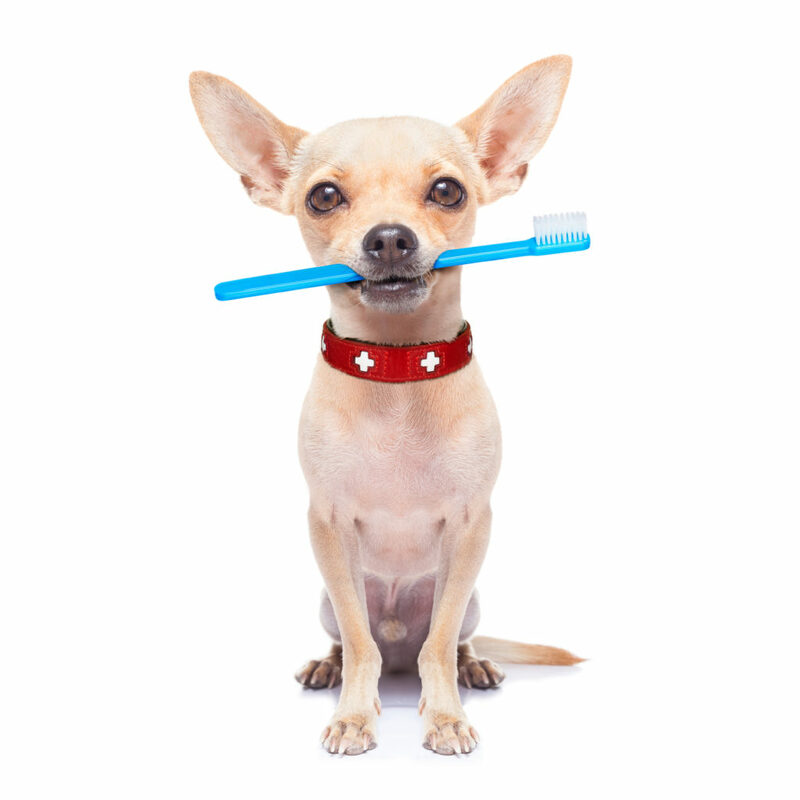 Prevention of dental disease in your pet is simpler than you think. The idea is to regularly remove plaque and tartar from his or her teeth. Regular brushing is the single most effective way you can keep their teeth healthy. While daily brushing is best, brushing several times a week is effective nonetheless. If you haven’t brought your furry friend for a dental checkup in a while, we recommend that you do so as soon as possible to minimize future complications and pain. Find a trusted and well-staffed animal hospital near you, such as Cherrelyn Animal Hospital, and make an appointment for a dental checkup for your pet today. Most of us aren’t experts in our own health. That’s why we visit the doctor when we’re sick and go in for our yearly checkup. We feed ourselves, bathe ourselves, and try to get as much rest and sleep as possible. The same should go for our beloved pets. Our furry companions don’t have the same autonomy as us, and it’s up to us to give them the best life we can – healthcare included. If you’ve ever felt overwhelmed at a veterinarian’s office, we’re here to help you understand why blood work for your pet and annual checkups are some of the simplest and easiest things you can do to ensure your pet’s wellbeing. What’s The Importance Of Blood Work And Checkups For Your Pet? For better or for worse, our pets cannot speak. Naturally, this means that they cannot tell us about any pain and discomfort. In particular, cats are especially good at hiding illness. According to a 2016 survey with over 2,000 respondents, 21% of cat owners said that their cat had age-related health issues. The real number is probably higher. That’s why it is always better for a trained professional to examine your pet from head to tail on a regular basis. Also remember that our pets do not have the same life span as us. Because they age at a different rate, we have to be extra diligent in regularly examining their health. Adult dogs should have a check-up and blood test annually, while older dogs should visit their vets twice a year. Having your pet’s health documented, especially when they are healthy, will help your veterinarian understand his or her baseline health. As your pet ages, we will be able to keep track of changes within his or her body. Understanding their unique biological makeup will also allow your vet to provide you with the best nutrition or activity recommendations as they age. What Kind Of Tests Should My Pet Have? When veterinary professionals speak of standard, routine blood work for your dog or cat, they are generally referring to two different tests: the CBC and blood chemistry. This test counts and analyzes the red blood cells, white blood cells, and platelets in a given amount of blood. In addition to red blood cells, the CBC will also measure hemoglobin levels, which is the molecule responsible for transporting oxygen in the blood. Low red blood cell count and low hemoglobin levels may indicate that your pet is anemic, while high red blood cell count and high hemoglobin levels may be a sign of dehydration. These levels give us information about the functioning of your pet’s bone marrow, spleen, and other organs. The CBC also counts white blood cells, as well as the numbers of each type of white blood cell. These numbers help us to paint a picture of your pet’s immune system, which will provide us with invaluable information in times of infection or crisis. The CBC also measures platelets, cells that help your pet to form clots when bleeding. Low levels of platelets can be a serious problem, especially if surgery is needed down the line. It could also indicate life-threatening diseases or infections. The CBC also gives us important insight on the color, size, and shape of these cells, which play a huge role in how they function. The information provided from this test allows veterinary professionals to optimally monitor your pet’s health, properly diagnose problems, and administer the best treatment, if needed. Blood chemistry aims to take a look at the fluid that blood cells move around in. A breakdown of this fluid gives us information about its chemical components and the functionality of the organs that filter or produce these chemicals. Some of these organs include the liver, the kidneys, and the pancreas. Furthermore, this test also looks at glucose, total protein, and calcium levels in your pet. The many chemicals and proteins we look at helps us to build a health portfolio for your beloved pet. For many of us, our pets are part of our families. They completely depend and trust in us as their owners, and it’s up to us to take on that responsibility. With the joy and company that they provide us, the least we can do is give them standard healthcare. Here at Cherrelyn Animal Hospital, we like to make sure that all pets are taken care of and loved. Find a trusted and experienced veterinary office or animal hospital near you and start off 2019 with your pet’s yearly checkup. Aside from the twinkling lights, gift-giving, and time with family, one other thing we like to look forward to during this season is feasting. But keep in mind that our pets cannot eat everything that we can. When you bring guests over, your friendly dog or cat may be waiting for scraps around the table. But warn your family and guests of the dangers that come from sneaking them a bite, as there are a number of dangerous holiday foods for pets to watch out for. Although we may be stating the obvious, chocolate is one of the most toxic foods for pets. While cats seem to be less tempted by chocolate, dogs are notoriously attracted to this delicious sweet. Chocolate contains caffeine and theobromine, which are toxic to both dogs and cats. Ingestion of small amounts can cause vomiting and diarrhea, while large amounts can cause seizures and heart arrhythmias. Different forms of chocolate vary in their toxicity, with dry cocoa powder at the top of the list, followed by unsweetened baker’s chocolate. As a general rule of thumb, the darker the chocolate, the more toxic it is for your pet. Any type of dessert that contains chocolate, such as brownies or chocolate chip cookies, should not be fed to pets. Xylitol is a sugar alcohol that is used as a sugar substitute in chewing gum, candy, peanut butter, store-bought baked goods, and other foods. A 2010 academic paper collected data on xylitol toxicosis in dogs in the U.S., finding that 2500 cases were reported in 2008. Xylitol is toxic to dogs and can cause low blood sugar and liver toxicity. Ingestion will cause a rapid and massive insulin release in dogs, leading to weakness, seizures, and vomiting. Pet owners should examine labels closely, especially on sugar-free products. Instead of being listed as “Xylitol,” it is sometimes listed as “Sugar Alcohol,” so be wary of both terms. Salads, baked goods, or even savory dishes can have raisins or grapes in them. However, raisins or grapes can cause sudden kidney failure in dogs and ingesting even small amounts can be fatal for both cats and dogs. Initial signs of poisoning include vomiting, diarrhea, and hyperactive behavior. After 24 hours, the pet may become lethargic and depressed. While raisins are more toxic to dogs than grapes, it is extremely important to keep any food items containing either away from your pet. Any type of caffeine is toxic for pets. It can cause seizures, heart arrhythmias, and even death. Therefore, caffeinated drinks, such as coffee and tea, can be dangerous. If you serve coffee or tea to any of your guests, advise them to keep their mugs away from your dog or cat. At safe and reasonable amounts, alcohol is fun and bubbly, but be extra careful to keep it away from pets. Even for humans, alcohol poisoning is a serious issue. For our fluffy companions, who are much smaller in body mass and lack tolerance, alcohol is significantly more toxic. Alcohol can lead to staggering, decreased reflexes, slowing respiratory rate, cardiac arrest, and even death. Fragrant and delicious, onions and garlic are found in many holiday dishes to provide some flavor, kick, and seasoning. However, they both contain thiosulphate, which causes red blood cells to burst in cats and dogs. This can possibly lead to something called hemolytic anemia, where red blood cells are destroyed faster than they can be made. Side effects of ingestion include vomiting, diarrhea, increased heart rate, and lethargy. The good news is that a small bite of food flavored with onion or garlic will not cause problems in most pets. Ingestion of large quantities, however, such as an entire clove of garlic, can be serious. Garlic has much less thiosulphate than onions, but it is recommended that both are kept away from dogs and cats. In particular, cats are more sensitive to garlic. Ham, bacon, and other pork products are high in fat content and difficult for pets to digest. They can cause pancreatitis, vomiting, diarrhea, and weakness. Even small portions of ham or bacon can contribute a disproportionately large amount of calories and fat to a dog or cat’s diet. We hope that your holidays will not be interrupted by concerning signs of distress in your pet. Be sure to review this list of dangerous holiday foods for pets before a gathering or party and inform your guests of the involved risks. If you begin to suspect that your pet has ingested something potentially toxic, call a professional veterinary clinic, like Cherrelyn Animal Hospital, immediately. Should You Worry About Poisonous Christmas Plants For Your Pet? When the holiday season rolls around, we all love a festive plant to spruce up the atmosphere of our living spaces. If you have a dog or cat, chances are that he or she will be curious about the new addition to the home. They might even sniff, chew, or rub their bodies against the plant. But this is where things can get dicey. As a pet owner, it’s important to know the truth about poisonous Christmas plants for your furry friends. Poinsettias are notorious for being the most deadly plant for pets. However, this is not quite the case. It is true that their brightly colored leaves contain a sap that irritates the tissues of the mouth and esophagus. Ironically, this very sap naturally deters ingestion. This means that even if your dog or cat eats the leaves, they will most likely ingest a very small amount due to the unpleasant sensation that results. In the case that these leaves are ingested, mild nausea, vomiting, and drooling will ensue. The good news is that it is unlikely for more serious problems to develop. Dogs and, in particular, cats are charmed by the appearance of a brightly lit Christmas tree in the living room. However, there are some risks to keep in mind. Fir trees produce oils that can be irritating to a pet’s mouth and stomach. These oils can cause excessive vomiting or drooling. If many needles are ingested, there is a risk of gastrointestinal tract irritation, obstruction, and puncture. Furthermore, drinking Christmas tree water can cause mild vomiting, drooling, and diarrhea. The presence of fertilizers, bacteria, or mold in the water can quickly cause sickness in your pet. Mistletoe and holly are iconic Christmas plants. Sadly, however, the leaves and berries of these two plants are generally more dangerous to pets than poinsettias and Christmas trees. Symptoms include intestinal upset, vomiting, diarrhea, excessive drooling, and abdominal pain. The ingestion of mistletoe is particularly worrisome for dogs and cats. Mistletoe is well known for causing severe intestinal upset, a sudden drop in blood pressure, breathing problems, and even hallucinations. If a lot is ingested, seizures and even death may result. To be safe, we recommend that holly and mistletoe be kept well out of your house altogether. For the safety of your pets, opt for the imitation version of these plants. Many enjoy the vibrant and eye-catching bulbs of the Amaryllis, which blossom into red, white, or pink flowers during the Christmas season. However, this beloved and beautiful plant is strongly toxic for dogs and cats. If the flowers and leaves are ingested, vomiting, diarrhea, drooling, lethargy, or tremors may occur. Be warned, though, that the bulbs are actually the most toxic. It can cause even more severe symptoms, such as seizures and changes in blood pressure. Generally, the Christmas cactus is considered a non-toxic plant. If it is ingested, mild vomiting, nausea, and diarrhea may occur. Thankfully, severe symptoms are not expected. Please be advised, that the consumption of any plant material may cause gastrointestinal upset for dogs and cats. Some plants may cause life-threatening problems for your pets, while others will not. For a look at the complete list, please refer to this ASPCA database. Keep in mind, however, that some plants have been treated with pesticides. In these cases, all ingestion may be potentially dangerous. Due to their small body mass, puppies and kittens are at highest risk for complications. Furthermore, cats are generally able to jump to high shelves on their own. For this reason, we recommend that, at least for poisonous Christmas plants, pet owners choose imitation versions over the real ones. If you do choose to bring any of these plants into your home, be sure to place them strategically and properly train your pet to avoid eating them. If you find your pet displaying any symptoms or evidence of ingestion, call a trusted animal healthcare provider, like Cherrelyn Animal Hospital, immediately. Even the word “heartworms” may make you feel squeamish and uncomfortable. You may have heard of them before, but do you know enough to help prevent heartworm disease in your furry friend? If you want to ensure the health of your pet, read on to learn more about heartworm disease and how it can be diagnosed, treated, and prevented. Heartworm disease is a serious disease caused by foot-long worms, called heartworms, that live in the heart, lungs, and blood vessels of dogs. While it can affect other animals, dogs are a natural host, meaning that heartworms can mature and reproduce in dogs. Because they have been reported in all 50 states across America, heartworm disease is a serious issue. What Would Heartworms Do To My Dog? Mature heartworms clog the heart and major blood vessels leading to the heart. By clogging the vessels, blood circulation to other parts of the body is reduced. Reduced blood flow to the lungs, kidneys, and liver causes these organs to malfunction. Immature heartworms, known as microfilariae, are much smaller than their mature counterparts and can clog small blood vessels. Again, organs are deprived of nutrients and oxygen supplied by blood. Unfortunately, by the time clinical signs are noticed, the disease is usually well-advanced. In the early stages of the disease, most dogs show no clinical symptoms. Signs of heartworms include a persistent cough, reluctance to exercise, fatigue, weakness, and loss of stamina. Dogs with serious cases may have heart failure or swelling in the abdomen, caused by fluid accumulation. Heartworm disease is not transmitted from dog to dog, but by mosquitos. When a mosquito bites an infected dog, fox, or another infected animal, it picks up baby worms. These worms mature into larvae, which are able to enter a new host when the mosquito bites another animal. It takes 6 months for the larvae to mature into adult heartworms. After maturation, they can live for 5 to 7 years in dogs. Because mosquitos are found nearly everywhere, all household pets are at risk for heartworm disease. Stray dogs or other wildlife may be carriers of heartworms and increase the chances of infected mosquitoes in your areas. Mosquitoes can also be blown great distance by wind and can easily enter homes. In many parts of the United States, mosquito season lasts all year round. Furthermore, each mosquito season can lead to more worms in an infected animal. The American Heartworm Society recommends that you “think 12.” This means that you should get your dog tested every 12 months for heartworms, as well as have them on heartworm preventive 12 months a year. Preventative options include pills, topicals, and injectable products. The cost of these options is fairly low, especially in comparison with the financial and emotional costs of heartworm disease treatment. If you want to protect and nurture the good health of your furry friend, bring him or her to a trustworthy clinic, like Cherrelyn Animal Hospital. Speak to veterinary professionals, who can recommend the best heartworm prevention plan for your pet. Did you know that just like people, it is important to take your pet for regular health visits? Even if your pet seems perfectly healthy, a veterinarian will thoroughly check every area of your animal’s health and functioning to make sure everything is working properly. An animal may not even show symptoms of being ill, so you would have no way of knowing something’s not right without a professional’s help. One crucial element to your pet’s physical examination is blood testing. Blood tests give us insights into your pet’s health, as well as a baseline for future testing. As your pet ages, health issues may start affecting your pet, issues that may only be detected through noticing changes within your pet’s blood work. Just like people, animals benefit from getting vaccinated against diseases. Rabies, hepatitis, and parvovirus are among the several diseases for which pets get vaccinated. The vaccines don’t only protect your pets–they protect you! A disease like rabies could be dangerous for you if your pet contracts it. Protect your animal and your whole family by getting your pet vaccinated. During a checkup, we also check your pet’s dental health. Just like people, pets can get cavities and gum disease, which can affect their comfort, their oral health, and the health of their overall body. We also examine for signs of oral cancer. It may not always be obvious which foods are appropriate for your pet. That’s why we check in with you about your pet’s diet and make suggestions based on your pet’s health, activity level, and size. Sometimes, a pet may need a prescription diet. We help you find the right diet for your pet so your animal can thrive and get all the nutrients it needs. At each wellness visit at Cherrelyn Animal Hospital, we perform comprehensive examinations so your animal can remain as healthy as possible. When diseases are caught early, they are much more treatable, giving you more healthy, happy years with your pet. Don’t wait to schedule your next veterinary visit. Call us today so your pet can get the medical care it needs.